Figure 1. Biopsy and Treatment Timelines for the Four Patients. 测序方法：whole-exome multiregion spatial sequencing on DNA that was extracted from fresh-frozen samples obtained from Patients 1 and 2，with paired-end reads of 72 bp and 75 bp, respectively, on Illumina Genome Analyzer IIx and HiSeq platforms. 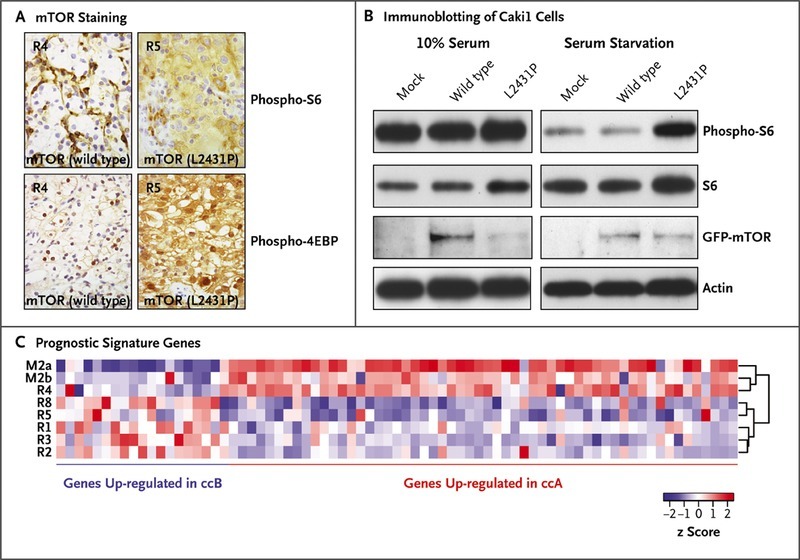 A low false negative mutation call rate is required to avoid overestimation of intratumor heterogeneity. We performed ultradeep exon-capture sequencing of R4 and R9 (median coverage of 262 and 255 reads, respectively) to investigate whether heterogeneous mutations that were not found in R4 or R9 could be detected by increasing the sequencing depth (i.e., the median number of sequencing reads across each exon). This identified all 64 mutations known to be present in R4 and 75 mutations in R9 and detected only 2 additional mutations (in ITGB3 and AKAP8, both in R4) present in other primary regions, indicating a low false negative rate of 2 in 141 (1.4%) (Table 3 in the Supplementary Appendix). A single biopsy revealed an average of 70 somatic mutations, approximately 55% of all mutations detected in this tumor. 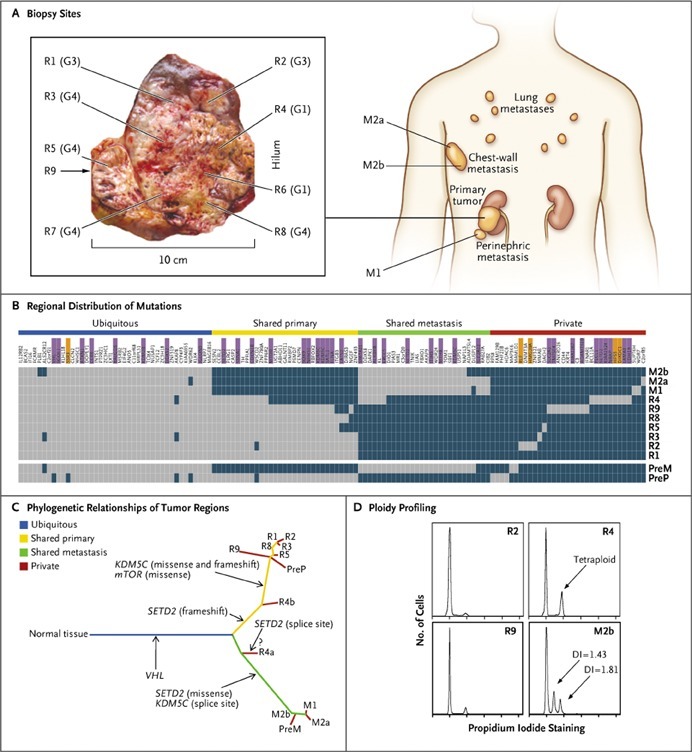 Only 34% of all mutations that were detected by multiregion sequencing in the nephrectomy specimen were present in all regions (31% if pretreatment and metastasectomy samples were included), indicating that a single biopsy was not representative of the mutational landscape of the entire tumor bulk. Figure 2. Genetic Intratumor Heterogeneity and Phylogeny in Patient 1. Figure 3. Correlations between Genotype and Phenotype in Patient 1. 解释：依维莫司不太可能影响这些标本中mTOR途径的活性，这些标本在药物停药后7天获得.（药物半衰期30小时）These data suggest that genetic intratumor heterogeneity is associated with functional heterogeneity of kinase activity. Figure 4. 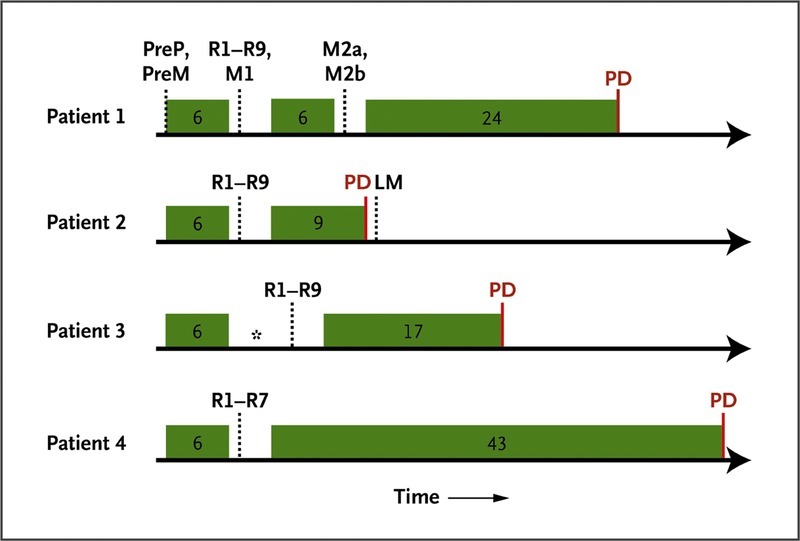 Genetic Intratumor Heterogeneity and Phylogeny in Patient 2. 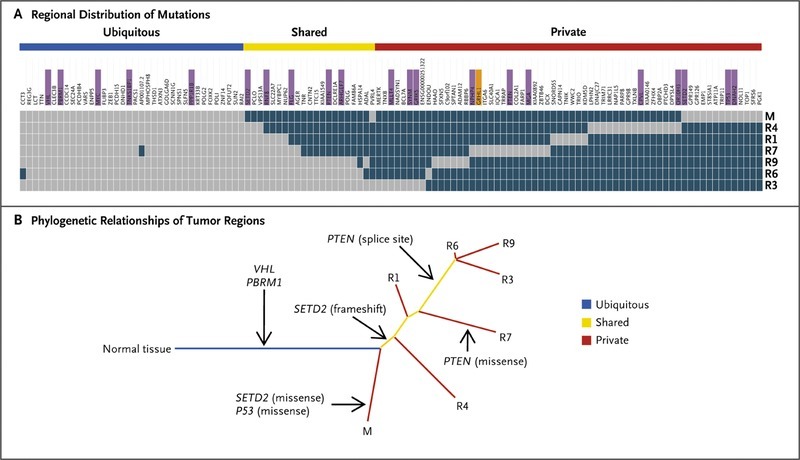 Genomics analyses from single tumor-biopsy specimens may underestimate the mutational burden of heterogeneous tumors. Intratumor heterogeneity may explain the difficulties encountered in the validation of oncology biomarkers owing to sampling bias,29 contribute to Darwinian selection of preexisting drug-resistant clones,12,30 and predict therapeutic resistance.13 Reconstructing tumor clonal architectures and the identification of common mutations located in the trunk of the phylogenetic tree may contribute to more robust biomarkers and therapeutic approaches.